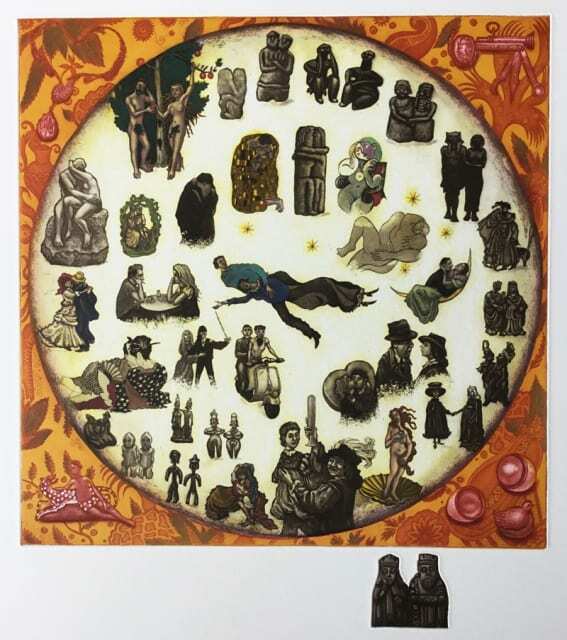 Mychael Barratt's work taps into the deepest of printmaking traditions and like Hogarth, he seeks out the humorous, the uncanny and absurd, along with the tender and poetic side of life. Delving into his extensive personal library of art books for inspiration, history and narrative are the cut and thrust of much of Mychael's work. His work encounters artists and literary characters from across the centuries, with Mychael re-imagining them as pet owners or assembled together in a life-drawing class. In other works he meticulously catalogues scenarios from Dickens or Chaucer, or maps out imagined locations from other great literary works. London, and its teeming history remains an important backdrop, with recent etchings including an ambitiously scaled 'Notes on the Underground' multi-plate etching which comprises of 270 individual drawings, one for each of London's underground stations. In 2016 he completed 'The London Map of Days' which comprises of 365 individual dates referencing specific historic dates in London throughout the centuries. The titles of his pieces are important as 'keys to understanding my motivation' he says. Working largely in etching and engraving, Mychael works in a studio he shares with Trevor Price (RE Vice President) where prints begin their life as preliminary sketches and drawings, carefully planned out in sketchbooks. The drawing is then transferred onto copper-plate using hard or soft ground, a kind of waxy resist used to protect the plate whilst it's in the acid bath. He then adds aquatint, a type of powder coating applied by hand, to give tone and texture. In earlier work, he applied colour in his etchings by hand, but this is now done by using multiple plates and a method of colour separation, each etching is the result of a complex series of processes, some of which date back to Rembrandt's era. Mychael was elected a member of the Royal Society of Painter Printmakers in 1999, becoming President in 2013. He was born in Canada, and came to London following art school in what was meant to be a two week stay in 1984. Twenty years later, he remains a London resident having fallen in love with the city, graduating from Central St Martin's School of Art in 1989. His work is exhibited all around the UK, including at the Bankside Gallery, The Royal Academy as well as Canada, the USA, Australia and New Zealand.